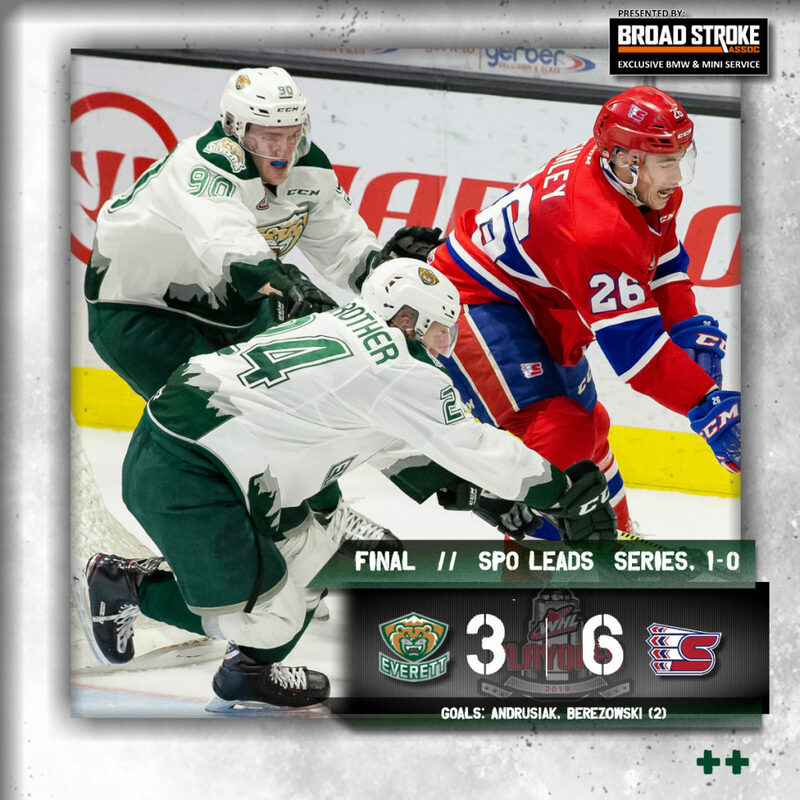 EVERETT, Wash. – Ethan McIndoe recorded a three-point night as the Spokane Chiefs defeated the Everett Silvertips, 6-3, in game one of the second round of the WHL Playoffs before 5,402 fans at A.O.T.W. Arena on Saturday night. Jackson Berezowski notched his first career WHL Playoff goal in his two-goal performance while earning second star honors. 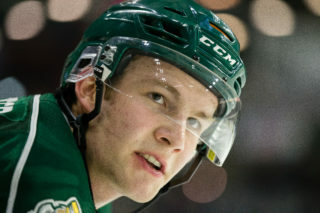 Zack Andrusiak also scored for Everett, as he now has five goals during his playoff run with the Silvertips. 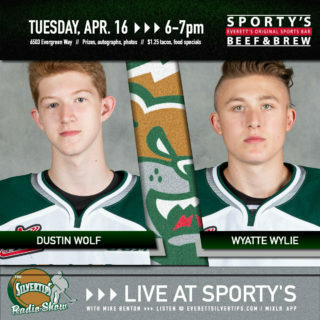 UP NEXT: The Tips look to tie the series up at home tomorrow at 4:05 p.m. for game two of second round of the WHL Playoffs against the Spokane Chiefs (1380 AM / 95.3 FM / TuneIn App / WHL Live). 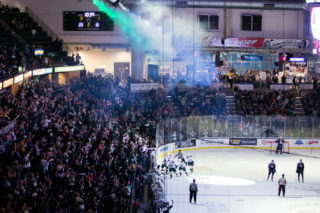 Tickets on sale at www.everettsilvertips.com/playoffs. 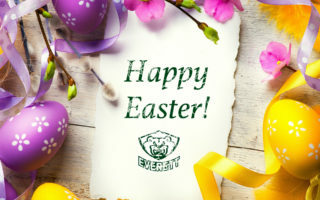 GAME 2: at Everett – Sunday, April 7, at 7:05 p.m.
GAME 3: at Spokane – Wednesday, April 10, at 7:05 p.m.
GAME 4: at Spokane – Friday, April 12, at 7:05 p.m. The Chiefs pounced on an early lead, 1-0, at 2:01 into the opening frame. Spokane center Jack Finley picked up a loose puck behind the Everett net and quickly fed McIndoe with a centering pass and finished with a shot top-shelf. Spokane defenseman Ty Smith committed an interference penalty at 12:47, which led to an Everett power play goal to tie the game, 1-1, at 12:54. Off a faceoff win, defenseman Jake Christiansen cycled the puck over to Wyatte Wylie who ripped a shot while stepping into the slot, where Andrusiak chipped in the rebound blocker side of Chiefs goaltender Bailey Brkin. The Tips finished the first period converting on one-of-three power play opportunities, while they outshot the Chiefs, 9-8. Spokane started the second with another early period goal, to give the Chiefs a 2-1 lead at 1:41. Chiefs defenseman Noah King hit center Eli Zummack with a long stretch from the defensive zone, as Zummack snuck a shot past on his breakaway from the right slot. Berezowski tied the game, 2-2, with 36 seconds remaining in the second period. Defenseman Gianni Fairbrother carried the puck along the near boards and blasted a shot from the left circle, which produced a rebound picked up by Gage Goncalves who connected with Berezowski crease front. Spokane winger Luke Toporowski gave Spokane a 3-2 lead just 39 seconds into the third period. Toporowski picked up a loose puck in the slot and delivered a wrist shot on the glove side of Everett goaltender Dustin Wolf. Chiefs forward Riley Woods tacked on another goal to put Spokane up, 4-2, at 10:20. Woods snagged a deflected shot and buried it from the base of the right circle. Berezowski retaliated and potted his second goal of the night to cut the Chiefs lead to 4-3 at 13:08. Forward Martin Fasko-Rudas finessed his way along the boards to the bottom of the right circle and connected with Berezowski in front, who missed on his first shot, collected the rebound and wired a wrist shot. McIndoe tucked in his second goal of the night on a wraparound to extend the Chiefs lead to 5-3. Spokane forward Luc Smith tucked away an empty net goal, off assist from McIndoe and Finey to seal a 6-3 win in game one. Despite the loss, Everett outshot Spokane 32-23. 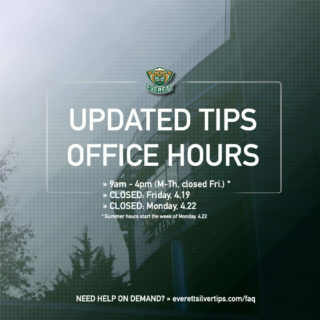 NOTES: Silvertips scratches included Riley Sutter, Dylan Anderson, Justyn Gurney and Jalen Price… This is the 5th time the Chiefs and Silvertips meet in the postseason (first since 2015, won by the Silvertips, 4-2) … the Silvertips are 17-13 lifetime in game one situations, and 12-3 on home ice … Both teams split the face-offs 32-to-32 … Everett went one-for-three on the power play.